I love cooking from scratch, but sometimes you just want quick & easy and these pumpkin pie bites are exactly that! Just a few ingredients (if you don't count the homemade whipped cream that you will probably already be making) and minimal preparation – these little pies pack a lot of flavor! Easier to Serve – there is no need to worry about having extra pie cutters, serving spoons, etc. Everyone can just grab one and go! Perfect for parties – we always think of “finger foods” as appetizers…why not desserts as well? This recipe is basically the classic Libby's pumpkin pie recipe, just in miniature form. You can use store-bought pie crust (or you can make the pie crust from scratch using the recipe that I shared in my other pumpkin pie recipe – that one is completely “from scratch”, right down to the filling). If you have children in school and they do anything for Thanksgiving (our school used to do a “mock Thanksgiving feast” in the younger grades), this would be great to send in – the kids will love getting their own personal pumpkin pies! These mini pumpkin pies are perfect for your dessert table or to take to a party. They are just so easy to make. Don't forget the homemade whipped cream! Roll out pie dough; use a 3" round cookie or biscuit cutter to cut a bunch of rounds. Place each circle into a mini muffin tin and form into a small pie crust. Combine pumpkin, eggs and evaporated milk together until well blended. 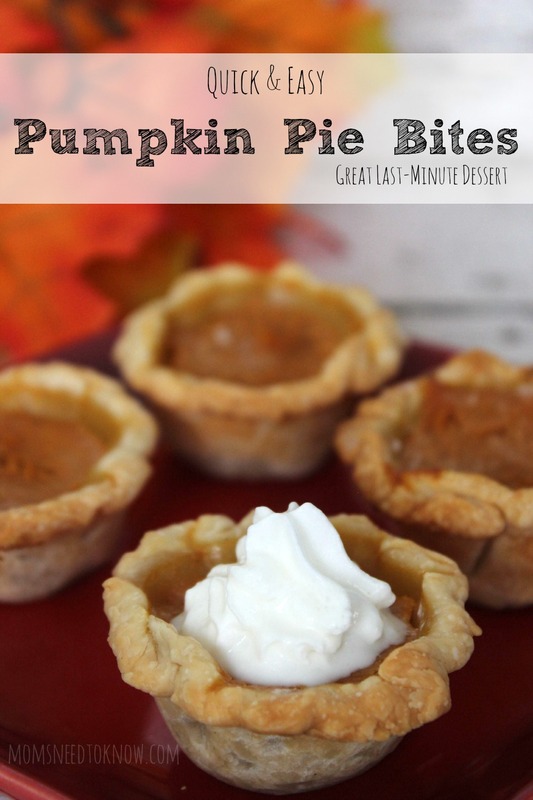 Fill each mini pie shell with pumpkin mix. Reduce temperature to 350F and bake another 20 minutes or until toothpick inserted in middle comes out clean. Remove from the oven and allow to cool completely on wire rack.